Channel this. Dive deep into the inner-recesses of your self-seeking ingenuity, and find peace. Cling to the fact that when Bukowski was asked whether or not he was going to just “sit there” on that Friday night, he answered, “Well, yeah. Because there’s nothing out there. It’s stupidity. Stupid people mingling with stupid people. Let them stupidify themselves.” And it’s the truth, isn’t it? In an LA that has been ranked 49th in global consulting firm Mercer’s 2016 survey about quality of life in the US, it’s an easy place to be miserable. The app, “Let’s Date,” calculated that 10% of the time, Angelenos were twice as likely to flake on a date than anywhere else in the country. We spend an average of $1,300 per year on gas just sitting in traffic, and god knows how much more circling a block looking for parking. More than half of us don’t own property, which means we have the highest number of renters in the country at 52% in 2014, and rent is climbing higher by the year. As we wallow in the hollow aura of Los Angeles, let’s look to one aspect of life that can fulfill us: embracing our solitude and tapping into the deep seeded existential brainstorm that will inevitably follow. And what better place to do this than the bars in the Back of Beyond that rest easy in our lonesome city? Unfortunately, the places where dear Bukowski did this are now known as the places where Bukowski did this, and thus are filled with the sort of people he would’ve hated. And there’s a high turnover rate of little joints where seeking solitude was possible; they’re constantly being turned into the next busy bar. To achieve such seclusion, I feel you have to venture into strange little pockets of the Westside: the little pockets where there’s been no incentive to change and really no need. 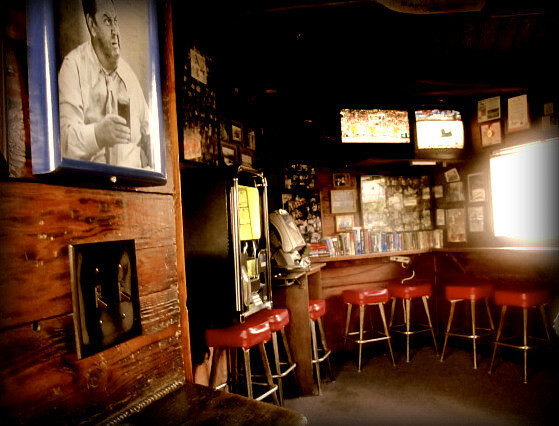 They’ve been around longer, unlike the neo-dive bars of Silver Lake or even Hollywood, and there’s something especially depressing about being in an affluent beachside area that has an ample number of dismal barroom establishments. Finding myself contentedly alone on Thanksgiving, I decided to give this thesis a test run. The results were flawless, and I was pleasantly sorrowful by end of my evening. To start, I cozied up at The Harbor Room in Playa Del Rey, which proudly displays a sign at the entrance reading, “OPEN but don’t expect too much.” My expectations remained high, though, and they were met. While it may be the tiniest bar in LA County, it’s large in personality, namely owing to the regulars who’ve each staked out one of the seven barstools years ago. The far wall is lined with an oddly curated shelf of pulpy novels, which is a perfect accent to a strong drink. And afterward, as a bonus, I aimlessly strolled the shore, careful to avoid rowdy students drinking on the beach who have yet to realize the magnitude of life’s futility. A quick drive landed me at Mar Vista’s Lost and Found: right across the street from a Whole Foods, (which I’m pretty sure I’ve chain smoked in front of while lost, looking for the bar in my drinking days), in a trying-to-be-rustic-chic strip mall. You enter through two pairs of saloon doors into a small, red-lit room that smells vaguely of feet. I had an awkward conversation with a pair of Brits and a red solo cup of club soda with a lime the bartender squeezed to smithereens and then stuffed deep into my drink. I maintained no qualm. I read yesterday’s LA Times from an old man who tried to hit on me, but between the rain washing away bodily remains from the fire, Saudi Arabia, and Ivanka’s emails, I was ready to move on to my final spot. The obvious conclusion to my expedition was Chez Jay, which, despite being in a lively tourist area of Santa Monica, has maintained local appeal and color. I’ve spent many a night there lounging in the back booth where JFK and Marilyn used to get it on, and while this booth was occupied with unsuspecting people, I felt pleased… I may have had curiosity about how the elephant got into the bar for the promo shot, (perhaps a discussion for another article), and I may have had curiosity about what specific individuals are doing here on Thanksgiving, but I didn’t ask anyone anything. I let everyone stupidify themselves. I poured tabasco into a shot glass of club soda and shot it hard, feeling every tingle of the hot burn at the back of my throat. Finally, at home and in a lavender bath, I buy a Creed II ticket for late in the night. I’ve needed all of this. It’s a beautiful thing to be alone in a crowded bar, a bathtub, or a Stallone movie. It’s just a beautiful thing to be alone.